This quick, one-skein crochet scarf is an attractive, lightweight accessory casual enough to wear with jeans and pretty enough to wear to a party. This scarf is an easy way to spice up your wardrobe - try a color that matches or contrasts with your favorite outfits! The motif, commonly called Queen Anne’s Lace, is a traditional crochet lace often used for blankets and tablecloths. This version of Queen Anne’s Lace is worked as a long strip and resembles a side view of the flower heads of a common plant by the same name (there are other knit and crochet patterns which differ but have the same name). One size fits most. Measures approximately 3.5”/9 cm wide, 55”/140 cm long. Each motif measures about 3.5”/9 cm wide, 2.5”/6 cm long. The pattern is currently available for purchase as a PDF download for $5.50. You will need a PayPal account or a credit card. Full written instructions and a symbol chart are included. As of February 01, 2009, the pattern includes an additional 4-page line-by-line symbolcraft chart with written instructions, designed so that each step has a symbol chart that that looks like the piece as it is being worked in your hands. If you have previously purchased this pattern and would like the additional chart, please email me (mail@mkcarroll.com) so I can send it to you. UPDATE May 2008: now available in UK/Australian terminology! 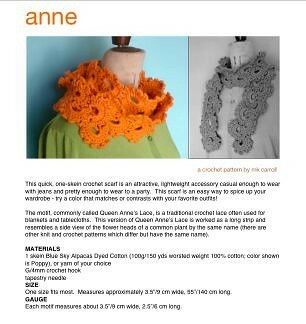 Pattern purchase through Ravelry will include download for both US and UK versions. This pattern looks great in different yarns, too! Measures 5"/12.5cm wide, 52"/132cm long - enough to wrap around the neck once.